Springville Remington is a remarkable dog. On July 5th of this year, Remy achieved his first pass towards his UKC Hunting Retriever Grand Champion title. He is the first English Springer Spaniel ever to accomplish this feat. His owner and handler is Serge Rasetta, of Ontario, Canada. How the two came together is a bit of an accident, Serge explains, because he and his brother, Romeo, were interested in getting a pair of Labradors for hunting. Romeo attended a Toronto sport and hunting show in early 1997 where he happened upon Frank O'Grady's booth. Frank, founder of the Springville Kennel, introduced him to the versatile breed, igniting an excitement to learn more. As soon as Romeo returned home, he telephoned Serge, who had never even heard of the English Springer Spaniel! Serge searched the internet for information about springer spaniels, liked what he saw, and the very next day the brothers drove to Springville Kennels. Frank had a litter of pups by AFC McGee of Bramble and Springville Pistol N' Roses born in February. It was the first week of April when they returned to bring a pair of pups home. The brothers flipped a coin to see who would choose their pup first. Serge got second choice. "First and foremost they love to hunt." 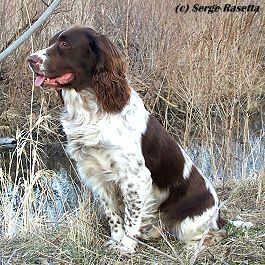 Serge's intention for Remy was that he becomes his hunting companion and the family pet. For two years Remy enjoyed life as a housedog, sleeping at the foot of the bed and hunting. Ontario has an early goose hunt. The young dogs, then just seven months old, went on their first hunt together. Romeo shot a crippled goose that set it's wings - sailing 60-70 yards out in a cut cornfield before hitting ground. With much gusto, the young, unsteady springers raced out to the wounded, hissing goose. Together, much like a tag team, they grabbed the goose with a nasty attitude. It was with sheer determination that young Remington and Browning managed to make the retrieve.